Bakery Industry: Sigpack Systems AG Renamed Bosch Packaging Systems AG . Sigpack Systems AG Renamed Bosch Packaging Systems AG . Sigpack Systems AG was taken over by Bosch in Fin year 2007-2008 . 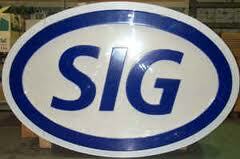 Sigpack systems have been used by bakeries all around world . Its packaging machine under series of GS , HS ,HM , HBM are widely used by bakery manufacturer. Now named as Bosch Packaging Systems AG . Bosch Packaging Technology, a leading supplier of holistic packaging and process technology, is changing the company names of its subsidiaries Sigpack Systems AG and Paal Verpackungsmaschinen GmbH, effective February 1. Sigpack Systems AG, based in Beringen, Switzerland, will become Bosch Packaging Systems AG. Paal Verpackungsmaschinen GmbH in Remshalden, Germany will become Bosch Packaging Systems GmbH. The renaming highlights Bosch's strategic approach to provide an even wider variety of solutions from one source. With technologies from feeding and distribution to wrapping, cartoning, handling and case packing, Bosch Packaging Systems offers a comprehensive portfolio for primary and secondary packaging. Bosch Packaging Technology, based in Waiblingen (Germany), is one of the leading suppliers of total solutions for packaging and process technology. The company develops and produces in 16 countries and distributes worldwide modules and systems for the pharmaceutical, confectionery, and cosmetics industries, as well as other food and non-food industries. The product range is rounded off with service solutions. For more information, please visit www.boschpackaging.com.